Most people take it for granted that we have yet to make contact with an extraterrestrial civilization. Trouble is, the numbers don’t add up. Our Galaxy is so old that every corner of it should have been visited many, many times over by now. No theory to date has satisfactorily explained away this Great Silence, so it’s time to think outside the box. Here are eleven of the weirdest solutions to the Fermi Paradox. There's no shortage of solutions to the Fermi Paradox. The standard ones are fairly well known, and we’re not going to examine them here, but they include the Rare Earth Hypothesis (the suggestion that life is exceptionally rare), the notion that space travel is too difficult, or the distances too vast, the Great Filter Hypothesis (the idea that all sufficiently advanced civilizations destroy themselves before going intergalactic), or that we’re simply not interesting enough. Though it sounds like something from a Twilight Zone episode, it’s quite possible that we’re stuck inside some kind of celestial cage. ETI’s may have stumbled upon our tiny blue marble a long time ago, but, for whatever reason, they’re observing us from afar. It might be that we’re entertainment for them (like watching monkeys in the zoo), or that they’re studying us for scientific purposes. Regardless, they’ve invoked a hand’s off policy and they’re leaving us alone. This idea was first proposed by John Ball in 1973, who argued that extraterrestrial intelligent life may be almost ubiquitous, but that the “apparent failure of such life to interact with us may be understood in terms of the hypothesis that they have set us aside as part of a wilderness area or zoo.” We could be part of a vast nature preserve that has been set off limits, free to grow unperturbed by intelligent life. It’s an idea that somewhat related to Star Trek’s Prime Directive in which civilizations are left alone until they attain a certain technology capacity. It’s also an idea that UFOlogists are partial to — the suggestion that aliens are essentially here, but observing us from a distance. Image: ssi.org. This is pretty much the opposite of the zoo hypothesis. Extraterrestrials have the potential to be dangerous. Like, extremely dangerous. So rather than fart around the Galaxy in spaceships and hope that everyone’s super friendly, ETI’s may have collectively and independently decided to stay the hell at home and not draw attention to themselves. And why not? It would be perfectly reasonable to conclude, especially in light of the Fermi Paradox, that the cosmos is filled with perils — whether it be an imperialistic civilization on the march, or a wave of berserker probes set to sterilize everything in its wake. And to ensure that nobody bothers them, advanced ETIs could set up a perimeter of Sandberg probes (self-replicating policing probes) to make sure that nobody gets in. Image: Cardens Design/Shutterstock. Imagine if there’s a kind of Prime Directive in effect, but that ETIs are hovering over us with a giant hammer ready to smack it down should it suddenly not like what it sees. These ETI’s would be like Gort from The Day the Earth Stood Still, intent on preserving the galactic peace. "There's no limit to what Gort could do,” said Klaatu, “He could destroy the Earth." So what is Gort or other advanced ETIs waiting for, exactly? One possibility is the technological Singularity. In the space of possible survivable Singularities, a sizeable portion of them might result in an extremely dangerous artificial superintelligence (SAI). The kind of SAI that could set about the destruction of the entire Galaxy. So, in order to prevent the bad ones from emerging — while giving the good ones a fair chance to get started — the Galactic Club keeps watch. We haven’t been visited by anyone because we’re living inside a computer simulation — and the simulation isn’t generating any extraterrestrial companions for us. If true, this could imply one of three things. First, the bastards — I mean Gods — running the simulation have rigged it such that we’re the only civilization in the entire Galaxy (or even the Universe). Or, there really isn’t a true universe out there, it just appears that way to us within our simulated bubble (It’s a ‘If a tree falls in a forest and no one is around to hear it, does it make a sound?’ type thing). Another more bizarre possibility is that the simulation is being run by a posthuman civilization in search of an answer to the Fermi Paradox, or some other scientific question. Maybe, in an attempt to entertain various hypotheses (perhaps even preemptively in consideration of some proposed action), they’re running a billion different ancestor simulations to determine how many of them produce spacefaring civilizations, or even post-Singularity stage civilizations like themselves. This one is similar to the quarantine hypothesis, but it’s not quite as paranoid. But it’s still pretty paranoid. It’s possible that everyone is listening, but no one is transmitting. And for very good reason. David Brin has argued that the practice of Active SETI would be like shouting out into the jungle (Active SETI is the deliberate transmission of high-powered radio signals to candidate star systems). Michael Michaud has made a similar case: “Let’s be clear about this,” he has written, “Active SETI is not scientific research. It is a deliberate attempt to provoke a response by an alien civilization whose capabilities, intentions, and distance are not known to us. That makes it a policy issue.” The concern, of course, is that we may draw undue attention to ourselves prematurely. It’s conceivable, therefore, that our collective governments may some day decide to shut down all Active SETI efforts. We should just be content to listen. But what if every civilization in the cosmos were to adopt the same policy? That would imply that everyone has gone radio silent. As an aside, it could also be dangerous to listen: SETI may be at risk of downloading a malicious virus from outer space. This one isn’t so much weird as it might actually be possible. An advanced ETI, upon graduating to a Kardashev II scale civilization, could lose all galactic-scale ambitions. Once a Dyson sphere or Matrioshka Brain is set up, an alien civilization would have more action and adventure in its local area than it knows what to do with. Massive supercomputers would be able to simulate universes within universes, and lifetimes within lifetimes — and at speeds and variations far removed from what’s exhibited in the tired old analog world. By comparison, the rest of the galaxy would seem like a boring and desolate place. Space could very much be in the rear view mirror. Now, it’s totally possible that the signs of ETIs are all around us, but we just can’t see them. Either we’re too stupid to notice, or we still need to develop our technologies to detect the signals. According to the current SETI approach, we should be listening for radio signatures. But a civilization far more advanced than our own might be using a different technique entirely. They could be signaling with lasers, for example. Lasers are good because they’re tightly focused beams with excellent informational bandwidth. They’re also able to penetrate our galaxy’s dusty interstellar medium. Or, ETIs could use “calling cards” by exploiting the transmit method of detection (e.g. by constructing a massive perfectly geometrical structure, like a triangle or a square, and put in orbit around their host star). And and as Stephen Webb has pointed out, there’s also the potential for electromagnetic signals, gravitational signals, particle signals, tachyon signals, or something completely beyond our understanding of physics. It’s also quite possible that they are in fact using radio signals, but we don’t know which frequency to tune into (the EM spectrum is extremely broad). More conceptually, we may eventually find a message buried in a place where we least expect it — like within the code of our DNA. Image: Arnold/Observatoire de Haute-Province in Paris. This interesting solution to the Fermi Paradox was posited by Milan M. Ćirković and Robert Bradbury. “We suggest that the outer regions of the Galactic disk are the most likely locations for advanced SETI targets,” they wrote. The reason for this is that sophisticated intelligent communities will tend to migrate outward through the Galaxy as their capacities of information-processing increase. Why? Because machine-based civilizations, with their massive supercomputers, will have huge problems managing their heat waste. They'll have to set up camp where it’s super cool. And the outer rim of the Galaxy is exactly that. Subsequently, there may be a different galactic habitable zone for post-Singularity ETIs than for meat-based life. By consequence, advanced ETIs have no interest in exploring the bio-friendly habitable zone. Which means we’re looking for ET in the wrong place. Interestingly, Stephen Wolfram once told me that heat-free computing will someday be possible, so he doesn’t think this is a plausible solution to the Fermi Paradox. Or maybe we haven’t made contact with ETI’s because we’re the aliens. Or least, they’re our ancestors. According to this theory, which was first posited by Francis Crick (yes, that Francis Crick), aliens spark life on other planets (like sending spores to potentially fertile planets), and then bugger off. Forever. Or maybe they eventually come back. This idea has been tackled extensively in scifi, including the Star Trek: The Next Generation episode, “The Chase” in which the uber-generic humanoid Salome Jens explains that its species is responsible for all life in the Alpha Quadrant, or Ridley Scott’s Prometheus, in which an alien can be seen seeding the primordial Earth with life. Even Arthur C. Clarke’s 2001 is a take on this idea, with the monoliths instigating massive evolutionary leaps. This one is similar to the Rare Earth hypothesis, but it suggests that the universe is still evolving and changing. Subsequently, the conditions to support advanced intelligence have only recently fallen into place. This is what cosmologist James Annis refers to as the phase transition model of the universe — what he feels is an astrophysical explanation for the Great Silence. According to Annis, a possible regulatory mechanism that can account for this is the frequency of gamma-ray bursts — super-cataclysmic events that can literally sterilize large swaths of the galaxy. “If one assumes that they are in fact lethal to land based life throughout the galaxy,” he wrote, “one has a mechanism that prevents the rise of intelligence until the mean time between bursts is comparable to the timescale for the evolution of intelligence.” In other words, gamma-ray bursts are too frequent, and intelligent life is constantly getting wiped out before it develops the capacity to go interstellar. Looking to the future, however, given that gamma-ray bursts are decreasing in frequency, things are set to change. 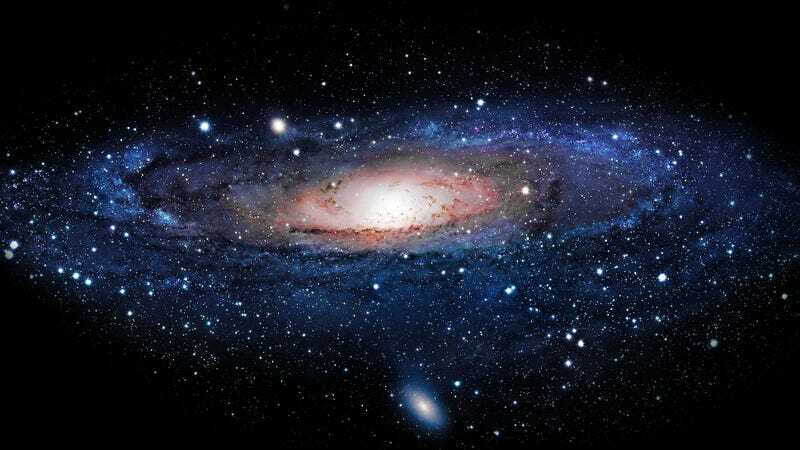 “The Galaxy is currently undergoing a phase transition between an equilibrium state devoid of intelligent life to a different equilibrium state where it is full of intelligent life,” says Annis. Which would actually be good news.